The open source community Seamonkey project was taken over from the former Mozilla suite on January 31, 2006. It retains the look of the Mozilla or Netscape browser, but it is built on the newest source code of Firefox. We can add to Seamonkey the same extensions as Firefox, which helps to make it a tool for webmaster and Web development. It includes a cookie manager that lets you view and delete cookies created when surfing with him (but not created with other browsers). The password manager, also absent on Firefox, presents a list that can be edited. - Silverlight 1.0 from Microsoft, the tool for the development of Web applications, or RIA. Although the XAML technology is concurrent of XUL on which are built Seamonkey and Firefox, this plug-in integration gives it a unexpected recognition. Real player, Shockwave and QuickTime for video and multimedia. A wysiwyg editor complete with a feature of upload through FTP or HTTP. Just give the login and password to put the page online once the edition is complete. Managing table allows the insertion of rows or columns, cell merging or cutting. Editing is synchronized in visual mode or on the HTML source code. But alternatively, unlike Dreamweaver that allows to edit in the two modes in two windows simultaneously. When one goes from one mode to another, the cursor will be at the top and not at edited code, and this is the weakness of this tool. So this is a tool sufficient for occasional use, but not professionally. An email client manager and newsgroups manager. A software of chat IRC (online discussion). 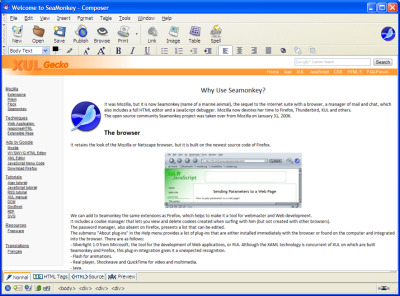 SeaMonkey is different from the original Mozilla suite. Taking advantage of the progress made in Firefox, it has become more compact and faster. Its interest lies in the integration of various tools and is suitable for users involved in the Web, who want to use all the resources of the network. SeaMonkey. Download the Internet suite.